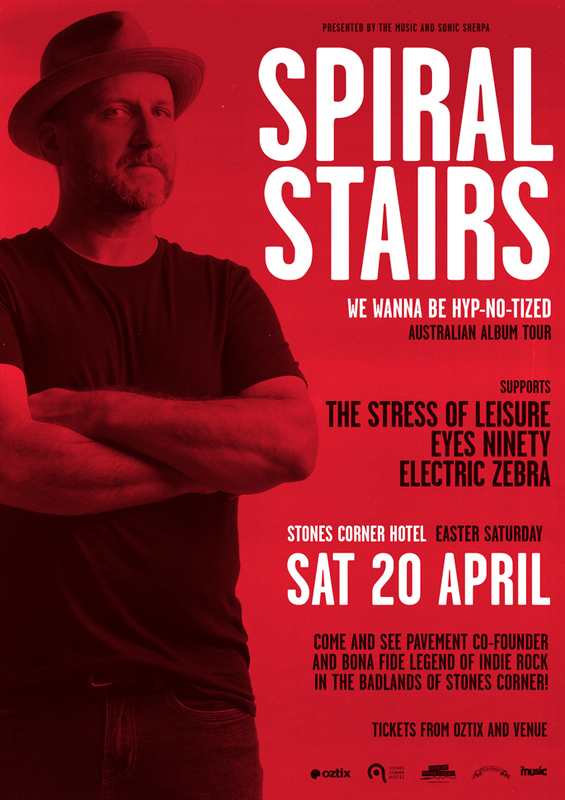 Spiral Stairs, aka Scott Kannberg, co-founder of the legendary band Pavement, is playing Brisbane Easter Saturday (April 20), and The Stress is proud to be joining him and band on the night. Also on the bill are those non-excitable top notch types Eyes Ninety and the emerging Electric Zebra. This is going to be better than a date with Ikea and what’s more, it’s in our old stomping ground of Stones Corner. Hark back to the early nineties and a younger Ian listened to Pavement almost relentlessly, lots of lyrics basically being imprinted on Ian’s cerebral cortex. Have loved seeing both Spiral and Malkmus play out since their Pavement days. So much great music. The quality continues. We can’t wait to play this one. We’re ready to be hyp-no-tized! Previous Post: Christmas Positive or Christmas Negative?